The future home of the Melnick Medical Museum, Cushwa Hall, got a face lift over the summer. A small piece of the project was to create several display areas for the museum to use in different areas throughout the building- increasing exposure to the museum and its collections. There are many students in this building, so I was very happy to have the opportunity to reach them on almost every floor of the building. These display areas will house small exhibits on specific topics and hopefully change every semester (or 3 times a year). 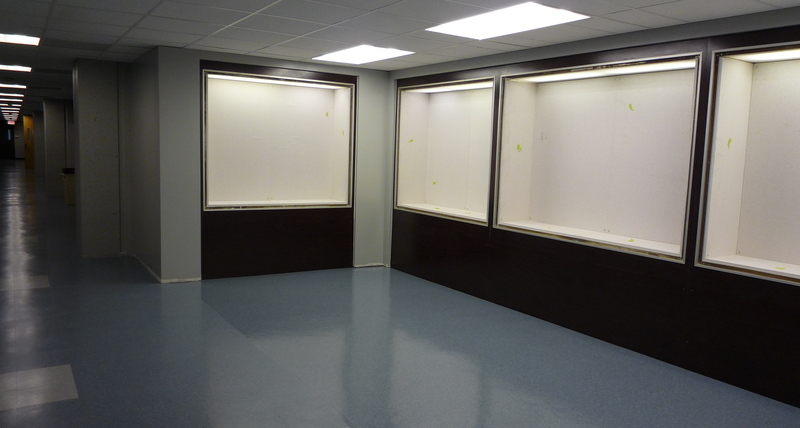 These are perfect spaces for health students or departments to create displays of historical or contemporary topics using the museum’s collection. I am very excited about the partnership opportunities! The main display area includes two groups of cases in the hall near the auditorium classrooms. Another set of display cases are arranged on the 3rd floor. In addition to these two display areas, a third space is being created on the 2nd floor. These cases will be custom made and large enough to display full size mannequins. Five monitors for electronic displays were also installed in the building. Most of these will be used by the college but the museum will be able to share them as well. One monitor on the lower level near the auditoriums will be for museum use only. Longer digital exhibits can be shown on that screen. So far, I’ve gotten a lot of positive feedback from the faculty in the building- and the cases aren’t even filled yet! Previous Post Project “Move” has begun! Next Post Look! We got a new website!